Click here to download the PDF file of the report. Further, the Iranian Judiciary should bring all efforts to bear to identify and bring to justice the perpetrators of the recent string of acid attacks against women in Iran, which have been linked to the extra-judicial enforcement of hijab called for in the Plan, the Campaign added. The acid attacks, which began in late 2014 in the Iranian city of Isfahan, involved unidentified men flinging acid into the faces of women with whom they had no history of personal grudges. At least fourteen attacks have been reported, and eyewitnesses have reported that the assailants proclaimed they were defending hijab during the assaults. No one has been charged in any of the attacks. “Unless state officials make it clear that any citizen who takes it upon himself to enforce female dress codes is acting illegally and will be punished to the full extent of the law, we can expect more of these horrific attacks,” said Hadi Ghaemi, Executive Director of the Campaign. 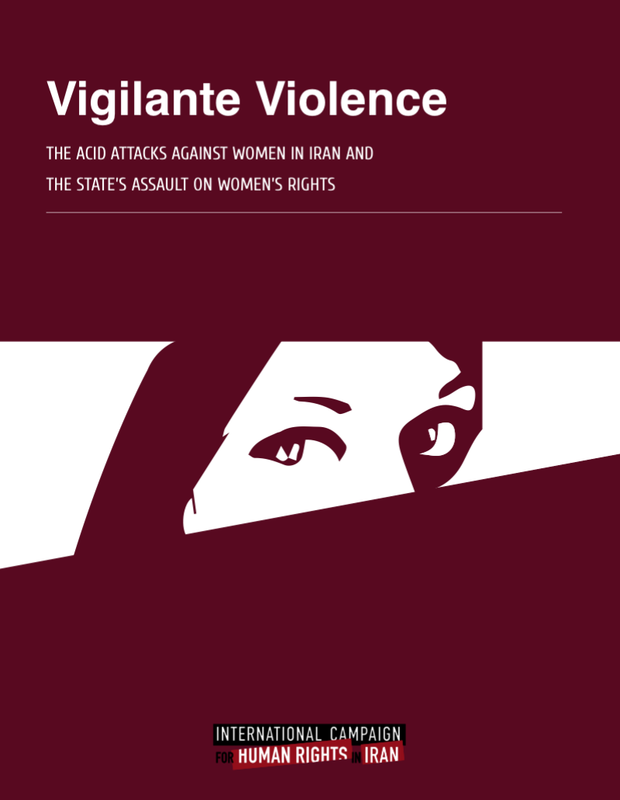 In a Briefing Paper released today on the occasion of International Women’s Day, Vigilante Violence: The Acid Attacks in Iran and the State’s Assault on Women’s Rights, the Campaign details the Parliamentary legislation, state policies, and public pronouncements by state officials and high-level clerics that have created a climate conducive to violence against women, and, specifically, fertile ground for the acid attacks in Iran. – Pending Parliamentary legislation, especially the Plan to Promote Virtue and Prevent Vice, which mandates enforcement of proper hijab and other acts of “virtue” by the Basij militia. – Detailed analysis of the activities of the principal vigilante group, Ansar-e Hezbollah, which has propelled forward the Promotion of Virtue legislation and its enforcement by the Basij. – Excerpts from interviews conducted by Iranian news agencies, before media coverage was suppressed by the state, with victims of the acid attacks and family members of victims. – Public pronouncements by state officials and high-level clerics that have called for the active, public enforcement of ultraconservative notions of female behavior and dress. – Other state initiatives that have sought to curtail women’s rights in such areas as education, employment, reproductive health care, and participation in the public sphere. – Recommendations to the authorities in Iran aimed at preventing further violence against women. “In addition to the corrective actions required by state officials in Iran, the international community must make clear to the Islamic Republic that if it is to achieve the full international rehabilitation and reintegration it seeks, these violations of the rights and safety of Iranian women must immediately cease,” added Gissou Nia, deputy director of the Campaign.